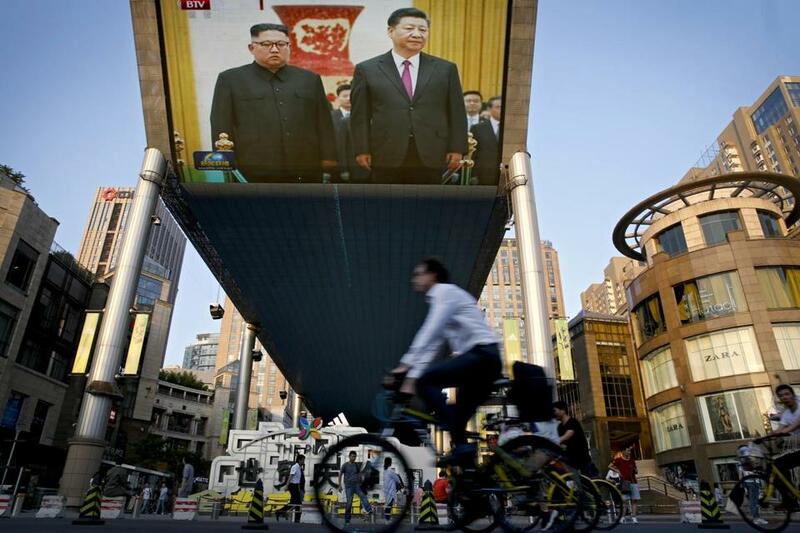 People bicycle past a giant TV screen broadcasting the meeting of visiting North Korean leader Kim Jong Un and Chinese President Xi Jinping during a welcome ceremony at the Great Hall of the People in Beijing in June. I want to warn the world about an unprecedented danger that’s threatening the survival of open societies. The rapidly improving instruments of control that machine-learning and artificial intelligence can produce are giving repressive regimes an inherent advantage. For them, these instruments of control are a help; for open societies they constitute a mortal danger. In China, President Xi Jinping wants a one-party state to reign supreme. Xi is trying to consolidate all the available information about a person into a centralized database to create a “social credit system.” Based on these data, people will be evaluated by algorithms that will determine whether they pose a threat to the one-party state. People will then be treated accordingly. The social credit system is not yet fully operational, but it’s clear where it’s heading. It will subordinate the fate of the individual to the interests of the one-party state in unprecedented ways. I find the social credit system frightening and abhorrent. Unfortunately, some Chinese find it attractive, because it provides information and services that are not currently available and can also protect law-abiding citizens against enemies of the state. China is not the only authoritarian regime in the world, but it is undoubtedly the wealthiest, strongest, and most developed in machine-learning and artificial intelligence. This makes Xi the most dangerous opponent of those who believe in the concept of open society. But Xi is not alone. Authoritarian regimes are proliferating all over the world and, if they succeed, they will become totalitarian. As the founder of the Open Society Foundations, I have devoted my life to fighting totalizing, extremist ideologies, which falsely claim that the ends justify the means. I believe that the desire of people for freedom cannot be repressed forever. But I recognize that open societies are profoundly endangered at present. How can open societies be protected if these new technologies give authoritarian regimes a built-in advantage? That’s the question that preoccupies me. It should also preoccupy all those who prefer to live in an open society. I WASN’T SURPRISED when Xi ran into serious opposition at home last summer; but I was surprised by the form it took. At last year’s leadership convocation at the seaside resort of Beidaihe, Xi was apparently taken down a peg or two. Although there was no official communiqué, the rumor was that the convocation disapproved of the abolition of term limits and the cult of personality that Xi had built around himself. The committed defenders of an open society in China have mostly retired, and younger people, who are dependent on Xi for promotion, have taken their place. In fact, it was retired leaders like Zhu Rongji who reportedly floated the criticisms of Xi at the Beidaihe meeting. It’s important to realize that such criticisms were only a warning to Xi about his excesses but did not reverse the abolition of the two-term limit. Moreover, “Xi Jinping Thought,” which he promoted as his distillation of Communist theory, was elevated to the same level as “Mao Zedong Thought.” So Xi remains the supreme leader, possibly for his lifetime. The ultimate outcome of the current political infighting remains unresolved. But open societies have enemies other than China, Vladimir Putin’s Russia foremost among them. And the most dangerous scenario is one in which these enemies conspire with, and learn from, one another in order to oppress their people more effectively. First, recognize the danger. Those of us who want to preserve an open society must work together and form an effective alliance. We have a task that can’t be left to governments. History has shown that even governments that want to protect individual freedom have many other interests, and they also give precedence to their own citizens’ freedom over the freedom of the individual as an abstract concept. But only the Chinese people can answer the question as to what will happen in China. All we can do is draw a sharp distinction between them and Xi. Since Xi has declared his hostility to an open society, the Chinese people have become the main source of hope. And there are, in fact, grounds for hope in this regard. As some China specialists have explained to me, there’s a Confucian tradition according to which the emperor’s advisers are expected to speak out when they strongly disagree with one of his actions or decrees, knowing full well that it may result in exile or even execution. That means that a new political elite has emerged that is willing to uphold the Confucian tradition, and that Xi will continue to have opponents in China. XI PRESENTS China as a role model for other countries to emulate, but he’s facing criticism abroad as well. His Belt and Road Initiative has been in operation long enough to reveal its deficiencies. For one thing, it was designed to promote the interests of China, not the interests of the recipient countries. Moreover, its ambitious infrastructure projects were financed mainly by loans, not by grants, and foreign officials were often bribed to accept them. And many of these projects have proved to be economically unsound. The iconic case is in Sri Lanka. China loaned the Sri Lankans the money to pay China to build a port that serves China’s strategic interests. But the port failed to attract sufficient commercial traffic to enable the Sri Lankans to service the debt, enabling China to take possession of the port. There are several similar cases elsewhere, and they are causing resentment. Malaysia is leading the pushback. The previous government, headed by Najib Razak, sold out to China. But in May 2018, Najib was voted out of office by a coalition led by Mahathir Mohamad. Mahathir’s government immediately stopped several big infrastructure projects being carried out by Chinese companies and is currently negotiating how much Malaysia will still have to pay China. The situation is not as clear in Pakistan, which has been the largest recipient of Chinese investments. The Pakistani army is fully beholden to China, but the position of Imran Khan, who became prime minister last August, is more ambivalent. At the beginning of 2018, China and Pakistan announced grandiose plans for military cooperation. By the end of the year, Pakistan was in a deep financial crisis. But one thing became evident: China intends to use the Belt and Road Initiative for military purposes as well. All of these setbacks have forced Xi to modify his attitude toward the BRI. In September, he announced that “vanity projects” will be shunned in favor of more carefully conceived initiatives, and in October, the People’s Daily warned that projects should serve the interests of the recipient countries. Customers are now forewarned, and several, ranging from Sierra Leone to Ecuador, are questioning or renegotiating projects. Xi has also stopped talking about “Made in China 2025,” which had been the centerpiece of his self-promotion a year earlier. Most important, the US government has now identified China as a “strategic rival.” President Trump is notoriously unpredictable, but this decision was the result of a carefully prepared strategic plan. Since then, Trump’s idiosyncratic behavior has been largely superseded by a China policy adopted by the agencies of the administration and overseen by the National Security Council Asian affairs adviser, Matthew Pottinger, and others. The policy was outlined in a seminal speech by Vice President Mike Pence on Oct. 4, 2018. Even so, declaring China a strategic rival is too simplistic. China is an important global actor. An effective policy toward China cannot be summed up in a slogan. It needs to be far more sophisticated, detailed, and practical; and it must include a US economic response to the BRI. The Pottinger plan doesn’t spell out whether its ultimate goal is to level the playing field or to disengage from China. XI FULLY UNDERSTOOD the threat that the new US policy posed for his leadership. He gambled on a personal meeting with Trump at the G20 meeting in Buenos Aires in December. In the meantime, the danger of a global trade war escalated, and a sharp sell-off in the stock market began, creating problems for the Trump administration, which had focused all of its energy and attention on the midterm elections the previous month. When Trump and Xi met, both sides were eager for a deal. So they reached one, though what they agreed to — a 90-day truce — is very inconclusive. But there are clear indications that a broad-based economic decline is in the making in China, which is affecting the rest of the world. A global slowdown is the last thing the global markets want to see. The unspoken social contract in China between the Communist Party and the Chinese people is built on steadily rising living standards. If the decline in the Chinese economy and stock market is severe enough, this social contract may be undermined, and even the business community may end up opposing Xi. Such a downturn could sound the BRI’s death knell, because Xi may run out of resources to continue financing so many loss-making investments. On the broader question of global Internet governance, there is an undeclared struggle between China and the West. China wants to dictate the rules and procedures that govern the digital economy by dominating the developing world with its new platforms and technologies. This is a threat to the freedom of the Internet and, indirectly, open society itself. Last year, I still believed that China ought to be more deeply embedded in the institutions of global governance, but Xi’s behavior since then has changed my opinion. My view now is that instead of waging a trade war with practically the whole world, the United States should focus on China; instead of letting Chinese telecommunications giants ZTE and Huawei off lightly, it needs to crack down on them harshly. If these companies came to dominate the 5G market, they would present an unacceptable security risk for the rest of the world. Regrettably, Trump seems to be following a different course: Make concessions to China and declare victory while renewing his attacks on US allies. This is liable to undermine the US policy objective of curbing China’s abuses and excesses. Because Xi is the most dangerous enemy of open societies, we must pin our hopes on the Chinese people, and especially on the political elite, which is inspired by the Confucian tradition. This does not mean that those of us who believe in an open society should remain passive. The reality is that we are in a Cold War that threatens to turn into a hot one. On the other hand, if Xi and Trump were no longer in power, an opportunity would present itself to develop greater cooperation between the two cyber superpowers. It’s possible to dream of something similar to the United Nations treaty at the end of World War II. This would be the appropriate ending to the current cycle of conflict between the United States and China. It would reestablish international cooperation and allow open societies to flourish. George Soros is chairman of Soros Fund Management and of the Open Society Foundations. © 2019 by Project Syndicate, www.project-syndicate.org.